In 1685, James, Duke of York, ascended to the thrones of England, Ireland and Scotland. As the first catholic monarch in 150 years many believed that his reign would be short and that he would be succeeded by his eldest daughter Mary, a protestant, who was married to her cousin William, Prince of Orange and Stadtholder of the United Dutch Provinces. James’ close ties to King Louis XIV of France served to fuel the fires of discontent, and when a male heir was born in June 1688 a number of nobles and clergymen, fearing a backlash of Catholic absolutism, invited William of Orange to take the throne. William duly invaded, and after a desultory campaign, James fled the country for refuge in France, it being claimed that his flight constituted a legal abdication but whilst William sought to consolidate his position in England and Scotland, the Earl of Tyrconnell – James’ viceroy in Ireland – began to prepare for his master’s restoration. Actively supported by King Louis XIV who viewed any military activity in Ireland as a useful diversion to keep his enemies occupied, James’ supporters enjoyed early success, but defeats at Newtownbutler, Derry and – above all – at the Boyne destroyed James’ confidence, and he fled his kingdoms for a second and final time. William’s army pursued the enemy to the gates of Limerick but failed to capture the city before winter set in, giving the Jacobites a much needed respite in which to reorganize and resupply themselves, during which time military supplies and a coterie of advisors led the by the Marquis de St Ruth, arrived from France. After failing to halt the Williamite crossing of the Shannon in the summer of 1691 St.Ruth, running out of room in which to manoeuvre elected to take up a defensive position and invite an enemy attack, occupying Kilcommadan Hill, near the Galway village of Aughrim. Although his own army was now at the end of a tenuous line of communication and supply, Godard van Reede, commanding the Williamite army, accepted the challenge and the two forces clashed on Sunday 12th July 1691. 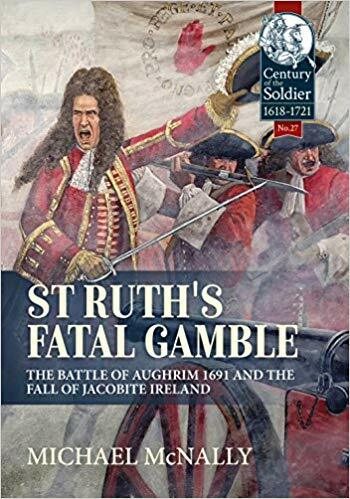 The strength of the Jacobite position was such that their opponents could initially make no headway, but an unordered redeployment of troops opened up a dangerous gap in their lines and when St.Ruth attempted to correct the error he was killed by enemy cannonfire. The Williamite cavalry charged into the gap and began to roll up the already fractured Jacobite lines, driving them from the field in the bloodiest battle in Irish battle in Irish history.